Appearance: On the banks of the Nile and throughout the delta, tall papyrus (Cyperus papyrus) clumps and thickets flourished. Meaning: The papyrus was a natural symbol of life itself and the primeval marsh from which all life came. Papyrus pillars were also said to hold up the sky. Papyrus shaped columns common in many temples may reflect this double symbolism. As early as the beginning of the Old Kingdom, papyrus served as a symbol of Lower Egypt. 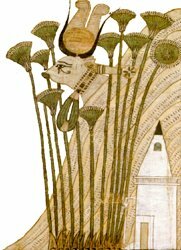 The plant was often shown with the heraldic plant of Upper Egypt, lotus as a representation of the Two Lands, the united Egypt. In art, the papyrus clump represented the marshlands. Naturalistic scenes of families wild-fowling often contained images of papyrus purely as its detailed and repeated hieroglyph. Finally, papyrus represented the concept of "around" or "behind". The hieroglyph was frequently paired with the sa sign of protection as a depiction of the phrase "All life and protection are around".